Heritage panel: House GOP members try to see the upside of defeat. 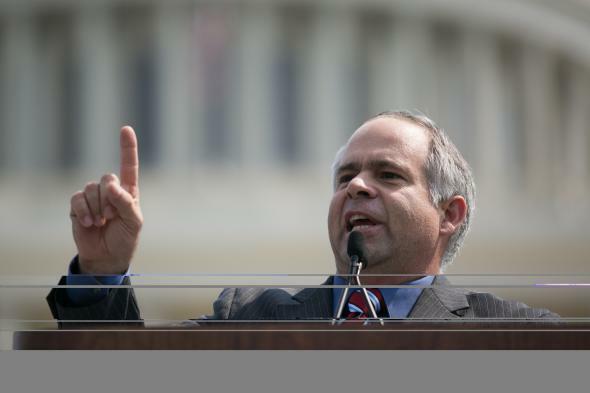 Rep. Tim Huelskamp, R-Kan., sees one upside to the House GOP’s failed debt ceiling brinskmanship. As Dave just wrote, a Heritage Foundation panel of Tea Party congressmen was chockablock with #slatepitches Wednesday, most of which came courtesy of Rep. Raul Labrador: John Boehner is great! So is Jon Stewart! We never asked for a full repeal of Obamacare; we just voted for it. And, for good measure, the shutdown didn’t distract the public from Obamacare’s implementation trainwreck, but actually brought it to the fore. But perhaps the most counterintuitive of all is the idea that the debt ceiling deal brokered between Harry Reid and Mitch McConnell is good news for hardline House GOP members. After the panel adjourned, reporters crowded around Labrador, Rep. Matt Salmon, and Rep. Tim Huelskamp to see how they’d spin the Senate deal. “Did the 20 moderates win this, and does that leave you guys depleted in some way in whatever the next battle is?” NPR’s Tamara Keith asked Huelskamp. Meehan is one of five Philadelphia-area Republican representatives who have voiced support for a “clean” spending bill that would fund the government without changing President Obama’s health law. The others are Charlie Dent, Mike Fitzpatrick, Jon Runyan, and Jim Gerlach. All are from moderate districts and are more susceptible to political challenges than many of their counterparts. Though five Pennsylvania congressmen said they wanted a clean CR last week, only one—Dent—ended up voting with King against a rule bringing a Republican plan to the floor last week. Being willing to stick one’s neck out may be admirable, but it isn’t a survival skill.